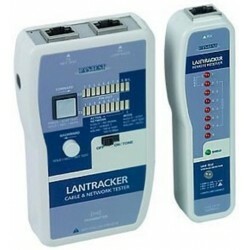 The Network/Cable Tester combines the capabilities of a network tester, pin by pin cable tester, and tone generator all in one device. It tests network and coaxial cables, generates a tone compatible with any tone probe, and tests the status and speed of the network. LED indicators for checking cable pins backwards and forwards. Automatic, network test, and manual/step test modes. Check cables with a loop-back test. Test coaxial cable with included adapters. Detect inactive devices and their speed. Detect AC or DC voltage on live lines. Generate tone on any pin of cable. Compatible with VPI's PROBE-NTWK network tone probe.